PRO_SAP has been an actor of BIM spinneret for years now. In fact it automates interchange files import and export. Structural designers increasingly use these functions in professional practice: building information modeling is becoming reality. There are a large number of conferences on the topic and they have a huge success: professionals have understood that BIM isn’t a software, or an ensemble of software, but it is a working method. The aim of BIM is first of all to generate a single model which contains all the information about the building. And as a second instance, to allows a quickly and easy information interchange between all the professionals that works on the building design (architectonical, structural, installations, etc.). Level 0: use of two-dimensional CAD software without a real information interchange with a common file format. Level 1: use of two-dimensional drawings and three-dimensional models. But each designer works on his own project with his own software. The information interchange is limited to images, texts and two-dimensional drawing. Level 2: this is the first level which contemplates a real data interchange. The structure is analysed with three-dimensional models generated with different software. Information interchange is automated using the IFC file format (IFC stands for Industry Foundation Class). This is the BIM level actually available with PRO_SAP: the program allows to import, export and update IFC files. Level 3: to reach this level all the professional that work on the project use an unique shared three-dimensional model. The model is hosted on a server which can be reached by all the designers. Level 2 BIM has already become a reality. A large number of structural engineers already use PRO_SAP BIM functions. The most common application consist in creating a finite elements model to study the structure and exporting an IFC file. The IFC file is sent to the BIM Manager who, among other things, collects all interchange files and check if there are some conflicts, for example between structures and installations. For example, with this technology, the classical case of a pipe which has to pass where there is a concrete beam can be avoided even before to start constructing the building, simply controlling the three-dimensional model. Please take care that data interchange won’t and can’t substitute engineers. Human control it’s always necessary and sometimes even to adjust the model. But, surely, this technology will help to reduce time needed to generate the models. PRO_SAP has BIM technology inside already. The first version of the program compatible with BIM was released in October 2014. The program follows the philosophy of “Open BIM”. It can read and write IFC files to dialogue with all the protagonists of BIM spinneret, both three-dimensional CAD programs and other finite elements programs. Operatively, PRO_SAP users just have to deal with the classic commands “Import”, “Update” or “Export”. The big revolution is the possibility to automatically interchange data with both three-dimensional CAD programs and other finite elements programs. BIM functions were released for free for all 2S.I. customers and are also available in demo versions. PRO_SAP demo versions, suitable even for business purposes, allows to use all the program features (including calculation report print and automatic generation of construction drawings). In particular e-TIME version could be used for free on Saturdays, Mondays and from 8 p.m. to 8 a.m. GMT all the other days of the week and it includes all PRO_SAP’s modulus. During the last years the technology was improved, even with user’s help and suggestions. 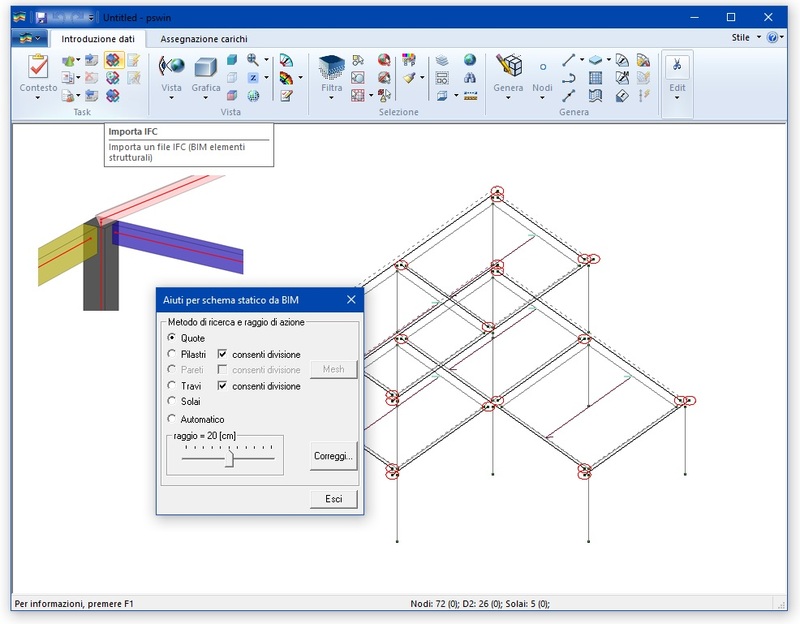 The command “Help for BIM” allows to automatically correct the geometry of the imported IFC model to connect the elements through nodes.